Oyedepo Prays For Jonathan, Inaugurates Goshen city | ItuaLive! Winners’ Chapel (also known as Living Faith Church) is a megachurch founded by Bishop David Oyedepo after an 18 hour vision in a small hotel called International hotel in Ilesa in the South Western part of Nigeria on May 2, 1981. He had gone to visit a friend who happened to be away and he suddenly heard a voice from God asking him to go to a place where he could talk to him. He booked a room in the hotel on the afternoon of May 1 and in the vision that followed, brother David Olaniyi Oyedepo as he was then called saw in a trance people walking past battered, bruised, afflicted, beaten,tattered,deformed and groaning and agonizing over their pains. He started sobbing and asked “Why Lord?” and the answer he got was ” But from the beginning it was not so”. He asked again ” But why Lord” and then he got the marching order ” The hour has come to liberate the world from all oppression and wickedness of Satan through the preaching of the word of faith and I am sending you to undertake this task”. This date has since become the anniversary of the church or “The Commission” as it is referred to by members. The Power House was set up immediately after the vision was received and a caucus of about 70 brethren engaged in 26 months of prayer and fasting in order to actualize the vision. The Faith Liberation Hour, a weekly teaching programme consequently took off . The church had its first service in Kaduna, Kaduna State, Northern Nigeria on September 17, 1983 and Pastor Enoch Adejare Adeboye of the Redeemed Christian Church of God commissioned the ministry. At inception the Kaduna branch consisted of four members and is now known as the “Garden of Faith”. During a Powerhouse meeting in April 1982, Brother David Oyedepo listed seven areas where God had spoken to him concerning the future of the ministry. He stated that “at the base of the commission will be a tent which will sit 50,000 people”. He stated that very soon there will be millions gathering at the base to listen to the gospel. He added that he saw them flying with the gospel on wings which showed that soon the ministry will have her own aircraft. He added that the whole world will soon be able to hear the message of the commission from the base. At that time, the internet as we know it today was not in view. At the inception of the ministry, David Oyedepo got instruction to commit the spoken word into writing with the same measure of proof. This led to the establishment of the Dominion Publishing House which won the Economic Community of West African States (ECOWAS) Gold Award in 1996 and has produced over 5 million books till date. In 1987 while in the United States he got an instruction from God to “Get back home and make my people rich”. This served as a major thrust for the prosperity message of the commission. He was ordained as a “Bishop” by the late Archbishop Benson Idahosa of the Church of God Mission in 1988. During the church’s Easter faith convention in April 1987,Pastor David Oyedepo announced that the church was to begin to spread out and on 27 May,1987, exactly a month later, the first five branches of the church were established in Mubi, Azare, Biu, Maiduguri and Bauchi. In 1989, Bishop Oyedepo received a vision from God to “Get down to Lagos and raise me a people”. This set the stage for the Lagos branch to start up in September 1989 with the name “Winners Chapel”. The first service in Lagos had about 300 people in attendance. By December 1993, the Lagos church had 3,000 worshippers and by December 1994, it had increased to 10,000. The number went up to 75,000 in single services by the middle of 1999. The name “Winners Chapel” soon became the popular name of the church even more so than the original name “The Living Faith World Outreach Centre” (LFWOC). Kaduna worshippers however still love to go by the name ” Garden of Faith”. The Garden of Faith is the national headquarters of the church. In 1993, the Vice-President of the Living Faith Church and then senior Pastor of the Maiduguri church, Pastor David Abioye was ordained “Bishop”. Bishop Abioye is an exemplary leader and an epitome of faithfulness in the Living Faith church and christendom as a whole. Driving back to Kaduna from Zaria after a meeting on May 4 1994,Bishop Oyedepo heard a call from God that “The harvest of Africa was over-ripe and that he should rush in and preserve it from decadence”. On May 8, 1994,the mandate was dedicated with a giant map of Africa and on January 15, 1995, the first missionaries left the shores of Nigeria. As at September 2010, Winners Chapel has branches in at least 63 cities in 48 African countries. The mandate to Africa is known as the African Gospel Invasion Program (AGIP). The foreign mandate is an arm of the World Mission Agency (WMA) of the ministry. In 2000, the prompting came to reach out beyond Africa and this mandate is now known as the “Mission to the World” (MTW). As at September 2010,there are at least 10 branches of Winners Chapel in the USA in cities like Houston, Georgia, New York, New Jersey, Maryland, Chicago, Dallas, Philadelphia, Minnesota and Massachusetts. There are also branches in the UK, UAE, Belgium, The Caribbean, Canada, China, Malaysia, South Korea and Japan among others all over the world; in Nigeria alone, there are about 2,000 local branches and over 1,120 satellite fellowships in the Lagos area. The Commission has 12 Pillars known as The Pillars of Faith. The Pillars are The Word, Faith, The Supernatural, The Holy Spirit, Prosperity, Prayer, Healing, Wisdom, Success, Vision, Consecration and Praise. The church teaches the importance of faith and that both divine healing and material prosperity are benefits of submission to God’s will. It belongs to the Renewal. The international headquarters of Winners Chapel is called Faith-Tabernacle. It covers about 70 acres (280,000 m2) and is built inside an over 7,000-acre (28 km2) church complex called Canaanland, the international headquarters of the ministry in Ota, a suburb of Lagos. The building took 12 months to be completed. The foundation laying took place on August 29, 1998 and the announcement of the time frame of one year for the building project was announced on September 13, 1998 by Bishop Oyedepo at the Iyana Ipaja church while work began on September 18, 1998. The dedication of the building took place on September 19, 1999 with 97,800 people in attendance. Faith Tabernacle is presently the largest church building in the world, with a sitting capacity of 50,400 people and an outside overflow capacity of over 250,000, with three services every Sunday. Construction completed in Canaanland till date is estimated to be not less than $600 million(N90 Billion). Faith Tabernacle is the fulfilment of the vision delivered in April 1982. Over 300,000 people have been counted at single meetings at Canaanland. Cannanland was procured in 1998 and was initially 560 acres (2.3 km2). Presently it is over 7,000 acres (28 km2) and will take about 110 km to navigate around it. As an educationist, Bishop David Oyedepo’s mission currently pioneers the establishment of educational institutions at all levels in and outside Nigeria, including the recently established “HEBRON” or Covenant University with over 7,000 students as well as Faith Academy with 1,500 students both located in Canaanland. Covenant university was well documented in a Nigerian Television Authority (NTA) documentary on the Nigerian 50th independence anniversary because of landmark achievements in its few years of existence. Covenant University was adjudged the best private university in Nigeria in 2005 and one of the goals of the institution is to be among the best in the world on or before 2020. According to Bishop Oyedepo, “Covenant University is not just an institution, it is a revolution in education”. Faith Academy on the other hand placed fourth of all secondary schools in Nigeria during the 2010 Senior secondary Certificate Examination (SSCE). The second university of the church known as Landmark University in Omu Aran, Kwara State is set to resume academic activities in October 2010. Construction at Landmark university is estimated to be in the realm of at least $35 million (N5 billion) so far. Bishop David Oyedepo stated in August 2010 that it takes a ride of more than 100 km to go around the walls of Landmark University. Landmark University consists presently of 1,400 acres. There are strong plans for at least 4 more universities to be constructed across Africa including Ghana, Democratic republic of Congo and South Africa as announced by Bishop Oyedepo during Shiloh 2007. 1,000 acres have already been acquired for the university in Ghana while 300 hectares (about 750 acres)have been acquired for the Congo university and this is going to be a French speaking university. Recently, President Yahya Jammeh of The Gambia appealed to the World Mission Agency (WMA) of the Living Faith Church to build a university in The Gambia. Some other projects that were announced during the initial foundation laying in Canaanland in 1999 include a towering administrative headquarters and 500 bed hospital among many other projects. Winners’ Chapel also runs a chain of about 10 Secondary schools and over 50 Primary and nursery schools in Nigeria. The mission is presently working on plans to build at least a secondary school each in every country in Africa. It also has its own Bible School, called Word of Faith Bible Institute (WOFBI); this is the biggest such group in Nigeria with branches in over 30 countries worldwide including the United States of America, the United Kingdom and the United Arab Emirates. As at 2004, WOFBI had trained over 100,000 people all over Africa. WOFBI has 15 campuses in the Lagos Area alone. Other assets of the Church are two aircraft including a Challenger 604 with call sign “N664D” which is listed in the Forbes 500. The Church aircraft fleet is known as the Dominion Airlines which is used strictly for missionary work and the church has also procured an aircraft Hangar at the Murtala Muhammed International Airport, Lagos. Construction is presently going on at the Hangar. The church has a fleet of over 400 buses that convey worshippers to and from Faith-Tabernacle, Canaanland. In August 2010, the church procured another fleet of 100 brand new buses. The second aircraft is parked at the Nnamdi Azikiwe Airport, Abuja for use by the vice president, Bishop David Abioye. The Church also owns Dominion Publishing House, which turns out books and other materials written by David and Faith Oyedepo and David Abioye. Bishop Oyedepo has written over 70 books apart from many also written by Bishop Abioye and Pastor (Mrs) Faith Oyedepo. An arm of the Ministry, World Mission Agency (WMA) provides welfare and other health and humanitarian services to the needy in the society. An annual amount of N100,000,000 (One hundred million naira)or $7,000,000 (Seven million dollars) is administered in scholarships for education up to first degree level to church members through the David Oyedepo Scholarship Scheme and channelled through the Satellite Fellowships where membership is validated. Automatic scholarship is also available to all children members of primary school age. During the bomb blast that rocked the Ikeja Cantonment at the turn of the last decade, the Red Cross announced that the consignment from the Winners Chapel was the largest by a single organization since the Nigerian Civil War. Also, the WMA has moved aggressively into Koma hills in Northern Nigeria where it sunk 47 boreholes in 1997 and built nursery, primary and secondary schools. The Church also provided relief to Liberian citizens during the Liberian Civil War. The Winners Chapel is currently undertaking the construction of “Goshen” which is a camp like Canaanland in Abuja and is along kilometre 26, Abuja-Keffi Road. 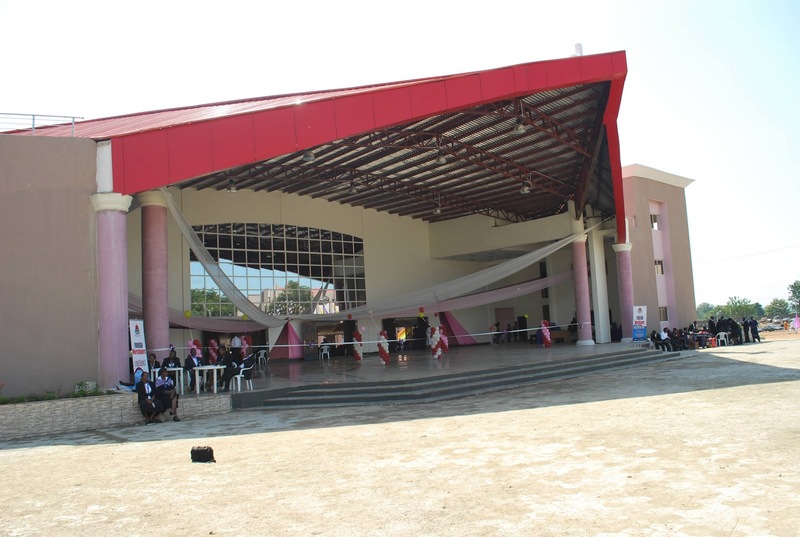 It has an ultra-modern auditorium which accommodates over 15,000 and a secondary school, Faith Academy, a Youth Centre as well as Kingdom Heritage Model School (nursery and primary) which were all dedicated on Oct 2nd 2010. The auditorium is a replica of the Faith Tabernacle. Goshen is complete with a dual-carriage way running through the 740 acre facility with street lightning as well as a housing estate with over 45 housing units among others and all these were constructed in only 15 months. There are plans for another university to be built in Goshen. Goshen is now the headquarters of the World Mission Agency. All over Nigeria and Africa, Winners Chapel have a lot of architectural masterpieces which emphasize utility. The use of pillars in her auditoriums are de-emphasized as this enables every worshipper to have visual access to the altar. Some of these masterpieces are Faith Tabernacle, Canaanland, Goshen, along km 26 Abuja-Keffi expressway, the old site of Winners Chapel in Durumi, Abuja, built in 6 months; Garden of Faith, Kaduna, Winners Chapel, Kano, Winners Chapel, Benue and Winners Chapel, Kenya to mention a few. Every December, Winners’ Chapel holds its annual Prophetic gathering, called Shiloh. The annual Shiloh event and normal church services at the Faith Tabernacle can be viewed online real time. Humm, THE POWER OF VISION ! I'M REALLY BLESSED READING THIS. GOD BLESS BISHOP OYEDEPO AND WINNER'S CHAPEL INTERNATIONAL.